Let your guests take a handful of beautiful petals! This rustic Confetti Basket comes with 5 litres of confetti petals which is enough for about 50-60 handfuls. 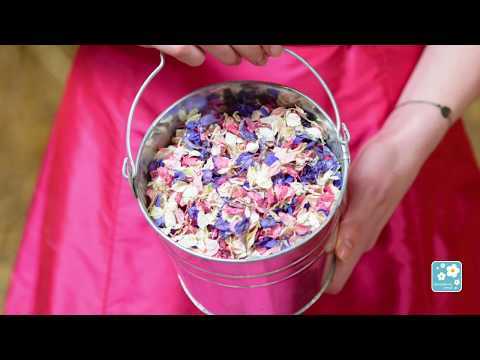 All our confetti petals are natural, biodegradable and eco-friendly. We think this package is perfect for a bridesmaid to hold and easily offer wedding guests a handful of confetti to throw over the newly married couple. The wicker basket measures 32cm (length) x 26cm (width) x 15cm (height) or 31cm including handle. Your confetti arrives in a bag measuring: 30cm (width) x 23cm x (height) x 10cm (depth at the bottom of the bag).